For most people, it means "Peace". I always thought it was the only meaning for this hand sign, well, besides two. 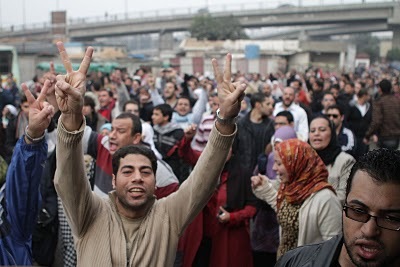 Recently, when seeing it being flashed all over the protests in Cairo and all over Egypt, I learned that here and a lot of the Middle East it means V for victory. I suppose that carries a whole other meaning. Most people seeing it from the west think it's the peace sign. I pray for both victory and peace for Egypt and Egyptians. We , as muslim brothers and sisters are all praying the same thing. InshAllah Allah will be on the side of righteous people. May Allah guide the people of Egypt to do what is best for Islam and the Muslims! May Allah protect those protesting on the streets against the tanks and guns and weapons of the regime! May Allah protect their loved ones from the plunder and looting of thieves and criminals (those in office and on the streets)! May Allah bring about a state of honor and glory for this religion, where righteous people are shown respect and given office, and the unrighteous are discarded and ignored! And May Allah protect us all, in this world and the next! Yes I remember I've seen this a lot in Palestine, especially during clashes with israeli soldiers or demonstrations.Indeed it usually means "victory". I hadn't really thought about it before but you're right! I hope things get better soon! How is everything in Hurghada? It's pretty much dead city here even though things were supposed to get up and running today - most of the shops are still shut and our supermarket is running low on food now. In Tunisia, if you do it at someone it basically means "stupid" or "ugly". Haha this is from my Tunisian husband btw. 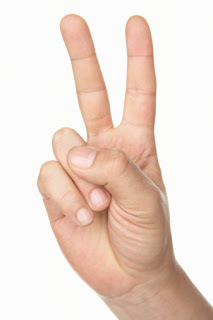 The peace sign originally was widely known as the ''victory'' sign during the second word war :) . V for Victory, how cool. I always thought it was the peace sign too. Insha'allah, definitely praying for both peace and victory for the Egyptians. Hope & pray that victory & peace will come soon for the people in Egypt. Take care sis! looool about UK.When we moved there, kids used to ask my son to show them the "2 fingers", and he didn't know what it meant at all.It was not a kind of bullying but it's because they knew he could do it as he was a foreigner and wouldn't get punished, so they loved to joke about the "fingers" with him lol.The teacher explained it to him and he went on doing it and got badly punished lol! Hmm...I never knew that! Thanks for clearing that up! Mona I pray that Allah swt give you and everyone in Egypt the strength to get through this, inshaAllah. We will miss you in our 30 Day Challenge. First off, it's you're as in, you are. Secondly, the word retarded is highly offensive to people of special needs and their loved ones. If you're gonna be a jerk at least be more creative.